Podcast has the edge to kill the dominance of FM Radio inside the car. I am sure, some time in near future, this is going to happen, in Kerala too. The season 5 finale of my favour serial Suits starts with Mike signing the deal with Gibbs and pleading guilty to fraudulent practice of law. Although Harvey tries his best to search for loopholes to tank the deal, he finds none. I have an idea on this aspect. According to my understanding of US Law, there should be a lawyer for the accused, when he is making a deal with the District Attorney. The lawyer has to ratify that deal before it is presented before the judge. If that is so, when Mike pleaded guilty, he becomes a person without a law degree. This makes him all alone, without proper legal representation, during the plea bargaining process. Since, Harvey, the leading lawyer in the case did not ratify the deal, signature of mike alone would not make the deal valid. Mike cannot be an accused pleading guilty and a lawyer ratifying the guilty plea, all at once, when the charge against him is fraudulent practice of law. This change in status of Mike on pleading guilty, was not noticed by the judge, who accepted the deal. In such circumstances, I believe, there is a way to reopen the guilty plea, for lack of proper legal representation for the accused, during the plea bargaining process. Let’s hope to see some more fun and legal action in the next season of Suits.! The pecuniary jurisdiction of Munsiff’s Courts in Kerala is capped at Rs. 20Lakhs. However, in the matter of succession certificate under Section 370 of India Succession Act, 1925, the Munsiff’s Court has unlimited pecuniary jurisdiction. This rare notification issued by the Kerala Government, investing powers of the District Court upon the Munisffs Court, is attached hereunder. The First Sports Magistrate of Kerala! 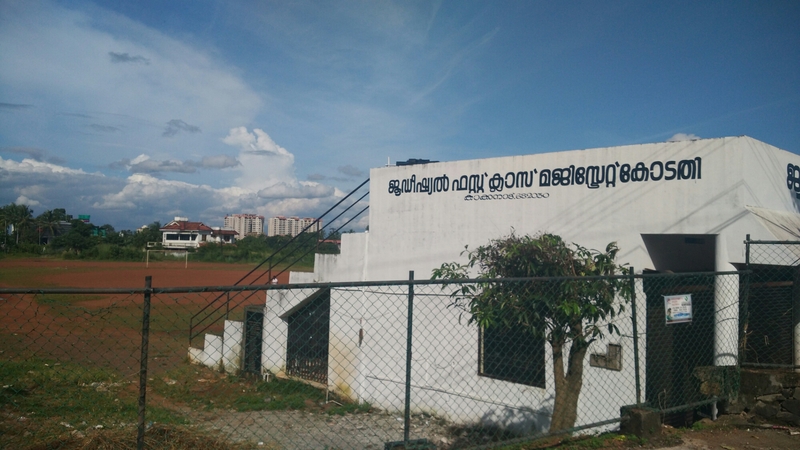 PS: For those who are in search of this newly established Court House, it is situated 100meters beyond the Thrikkakara Police Station, on the same road where Thrikkakara Sub-Registry Office and Red-Cross situate. The transition from bike happened after a sting of stiff neck experience and discovery of a vestigial bone call cervical rib, that was squeezing my nerves. The Doctor said “no more biking”. I have always maintained that a two weeler is the best mode of transport, in kochi, unless you have the luxury of time and a chauffeur. I didnt have both. During the initial days after the forced transition, I used Ford Figo. The driving experience in city was so horrible, I hated my life, being wasted on traffic jams. There were days I was forced to drive around Kerala High Court, three four times, just to find a parking space. In two weeks, I decided to buy a compact car like Tata Nano or Mahindra Riva, for the sake of convenience. After some consultation with my auto-enthusiastic friends, I squared on Tata Nano Twist XT. The on-road price of Nano Twist XT is 2.60Lakhs, in Kochi. The car was delivered on the third day of booking, and I have been using it for a month. Exhilarating, Liberating and Economical !!! are the terms I would use to deacribe the driving experience of Nano Twist. The car is so easy to handle, park and drive in city-traffic, it is the ideal second car, one can opt for. The seating is perfectly suited for a six feet like me, unlike the deep seating of most of the popular cars. Nano can zip through the unofficial two-wheel lane, like an auto-rickshaw. The acceleration is mind-blowing and without comparison. It doesnt have the infamous kudu-kudu-auto-rickshaw sound generally attributed, at-least inside the cabin. The car is spacious, despite the compact size. Honestly speaking, I’m in love with Tata Nano. I dont know why people is so prejudicial about it, and thinks so low about it. Nano is the best car and the most used one, among the five cars I have at home. Drive it once before making a judgment, you will understand it yourself.